I love pumpkin pie. One of my very first recipes on this blog was for a pumpkin pie that called for tofu. This year, I wanted to create a soy free pumpkin pie. This was my first experiment and it went well. This isn’t exactly a pie, but it’s delish and grain free. 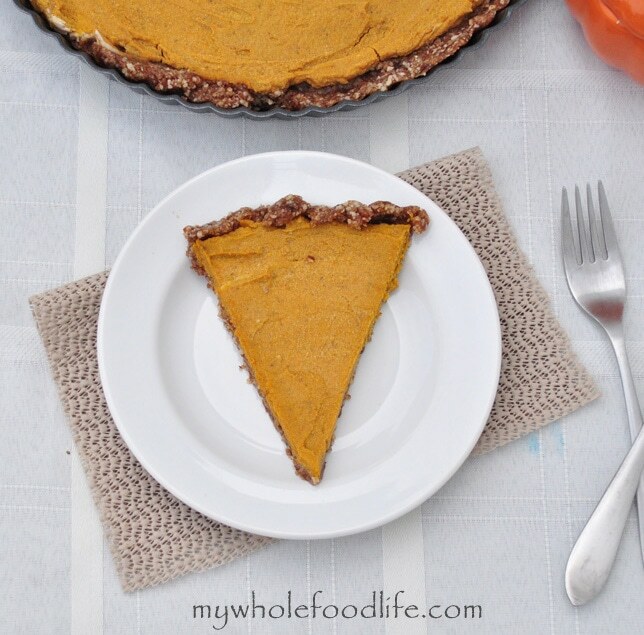 I still have plans for a gluten free and vegan pumpkin pie in the future too, but this pumpkin pie tart is a contender for anyone looking for a pumpkin pie dish who is also in the mood for the creaminess and richness of a tart. My daughter Meadow, who claims to dislike all things pumpkin, ate this. In fact, both my girls enjoyed it. If you are not a fan of coconut milk, please understand that you cannot taste the coconut in this recipe. The pumpkin and warm spices totally cover it up! Kind of like in my Pumpkin Ice Cream. In a food processor , combine all the crust ingredients except the dates and pulse into a course ground consistency. Then add in the dates and pulse until a dough starts to form. You may need to add a tiny bit of water, but I did not. Once the dough is formed, press it into a greased tart pan . Stick in the fridge to firm up. The night before you make this, place your can of coconut milk in the fridge. In the food processor , combine all the ingredients for the filling except the coconut cream. Mix well. Open your chilled can of coconut milk and scoop out the white solid part. Discard the water leftover, or save it for smoothies. Spoon out 1/2 cup and put in the mixer bowl. Whip the cream in a mixer to get some air in it. Once it looks more like whipped cream, slowly add in the pumpkin mixture by folding it in. Do not mix the two together. Just keep folding the pumpkin mixture in until all are combined. Spread the mixture into your tart shell and chill in the fridge for at least 30 minutes. You can save the leftover coconut cream from the can, for topping the tart if you wish. This should last at least 5 days in the fridge. Enjoy!